On Thursday in okota, lagos a cow went insane and chased people about in broad daylight. The video clip shows that the cow is seen giving people a scary chase as they ran in different directions, evidently for not losing their lives. 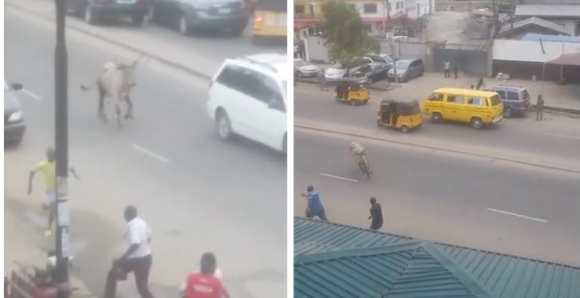 At one point in the footage, a danfo bustried to bump into the cow in a bid to suppress it, but the animal fled being hit and continued its rampage. It then charged directly at two persons riding on a bike. The two men jumped off the bike and ran for their lives. The slightly crazy animal did not stop its violence even after being hit from the side by a bus but attempted to hit the vehicle with its horns.